Both Google Docs and Dropbox have pros and cons. For example if you access a document on Dropbox online, you can't edit it. On the other hand Google Docs doesn't have a sync tool that syncs to all your devices the way Dropbox does. To start, you need to have Dropbox already installed on your primary laptop or pc. Next, you need to install a tool that syncs your Google Docs back to your primary laptop. A good tool for this is Insync (not to be mistaken with the boy band from the 90's). 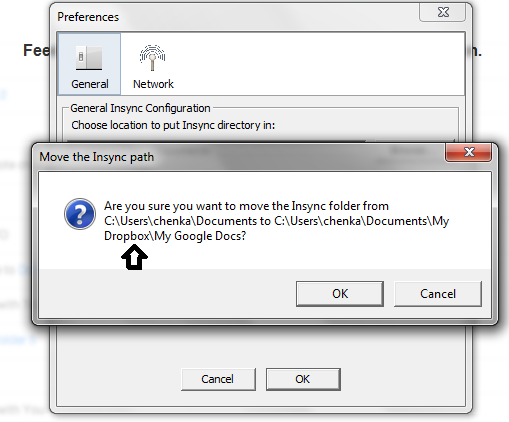 On its own, Insync acts like Dropbox but works exclusively with Google Docs. Follow its instructions to install it on your laptop and you are almost there. The last step is simple. All you have to do is move the Insync folder to your Dropbox folder. You do this by going to the settings menu of Insync, and use the preferences setting to move the Insync folder to Dropbox. See the illustration below. Now you have Dropbox syncing files to all your devices and keeping Google Docs in sync as well. A nice way to stay organized!